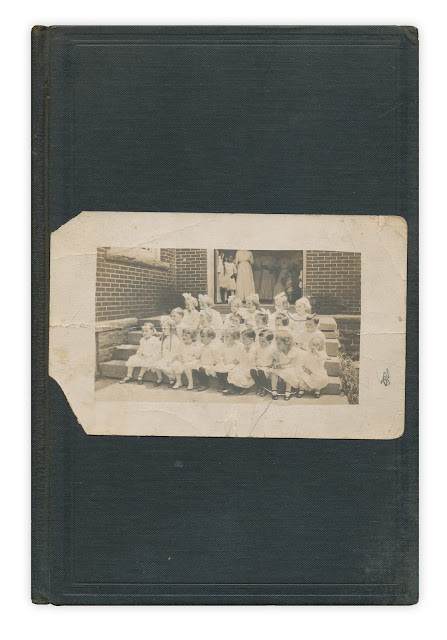 School photograph, no date or writing on reverse side. Found in "Señor Bum in the Jungle" by Algo Sand. Published by National Travel Club, 1932. This is a delightful photo! Circa 1910, I'd say, looking at the shirt-waisted ladies in the doorway. Only three little boys; perhaps this is a Sunday School class, or a first communion? As always, I so wonder who is the little bright head that has been circled.